Spring has really come once the cherries start to bloom. Along with the tulips, the red maples are also starting to leaf out and bloom. As you probably know by now, I am inspired by color. However, I do not like the way that most gardening books deal with flower and leaf color. Most of the books I've seen have clashing colors that jar the eye's sensibility. I am a fan of a limited palette of color, both on the plate and in the garden, relying on texture and the subtle play of color to create a "wow" effect. Trees have edible leaves, many of them. I recommend my favorite data base "Plants of the Future" to guide you on eating edibles. My favorite trees are linden leaves. I've made pestos with birch leaves and linden leaves. The problem with tree leaves is that they are very tough, unless just leafed out. April-May is a great time for new leaves. But taste one of them first. Sometimes they just don't taste very good. Aspen and poplar leaves are edible, but a bit acid tasting. Maple leaves are pretty boring and quickly get tough. Before I give you this recipe, a word about edible plants and flowers. It is a sure thing that you will be allergic to some food that you may try. People tend to have bad problems with pollen. Although some plants are deathly poisonous and should not be grown at all, no matter how beautiful (rhododendron, oleander) people have trouble with allergens in plants from anything from hay fever to peanut allergies. Some plants may cause a mild reaction, some violent, some may merely give you indigestion or make your joints hurt. PAY ATTENTION!!! Your body is smarter than you are and often that migraine or stomach ache is its way of trying to tell you that you should not eat the food. You should also be aware that sometimes you can eat a little of something but develop an intolerance with larger amounts, or if also challenged by pollen. For instance, many people cut back on grains (wheat, corn, sugar, beer) when the grass is blooming because the overload of the grains on top of the grass pollen (also in the grain family) makes everything worse. Having said that, I'm all for trying new foods once you verify that they are not poisonous. Maple is not poisonous in any form and people commonly eat maple syrup; however some people are allergic to maple pollen when the trees are blooming. I did have an allergic reaction (mild asthma) to my salad here, and I suspect maple. I did not grow up around maple trees and they are in full bloom and we've been having respiratory allergies. GO SLOWLY. Eat only a little of a new food, no matter what it is. Before I eat a "weird" plant, I read up on it and taste a little and spit it out and wait for a reaction. I am allergic to hundreds of foods, so I just have to go slowly with everything. The Japanese have eaten cherry blossoms every spring for hundreds of years. They also eat the leaves. Many members of the rose family such as cherry, almond, apple and plum, may have edible fruit, but have toxic seeds or leaves. Cyanide is from bitter almonds. I have eaten almonds that have made my mouth numb and made me think I was going to die from cyanide poisoning. It takes a bit to suffer death, but like many other plant families common to us like celery, spinach, and tomatoes, parts of the plants can be poisonous or other members of that family can be poisonous. So, to be on the safe side, I used these blossoms as decoration, and only ate a little of them although I read enough to know that they are okay to eat. They may be okay to eat, but not okay for ME to eat. I have no allergies to other plants in this family, so I went ahead and tried the blossoms. No problem. There are also maple leaves in this salad, which are no where near toxic, but again, may cause allergies, and tulip petals which are also benign. I ate this salad with a fish entree. Unlike most raw foodists, I am not vegan. I am allergic to most nuts including almonds and coconut, and am very allergic to all grains and most legumes. I'm also allergic to citrus and soy and many other raw staples. I also cannot eat eggs, dairy, or chicken, so my options are very limited. Vigorously mix the mayonnaise until it gets stiff. I eat a lot of raw fish. 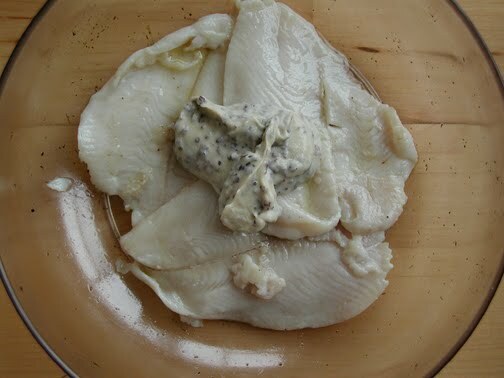 Many people soak fish in lemon or you can lightly steam or heat the fish on a skillet to warm it up. This sole was warmed. 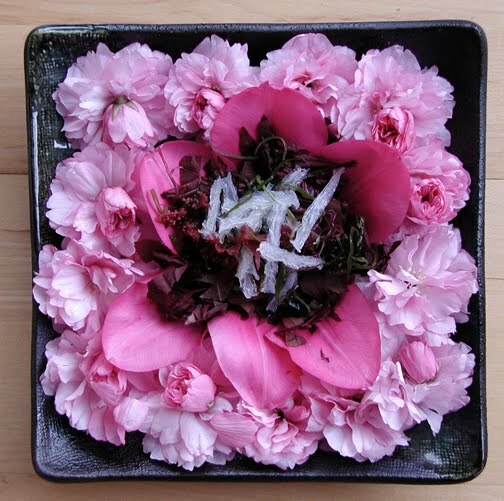 I ate it with the seaweed and maple and tulips and a little bit of the cherry blossoms. Very filling and yummy! Enjoy the flowers, but be sure you take it slow and know what you are eating. Easy flowers to start with are herb flowers, vegetable flowers and common edibles like pansies, roses, and calendula. Hello Anne...I was looking for an image to go with an article I'll be posting very soon to tie in with my Tulip fascination. I was overjoyed not only to find such a beautiful image, but also to discover your blog. How charming you are. Anyhow, if you have any qualms about using your image of this salad (with credit, of course)... please let me know very soon. Thank you.